Fight for free, public education! Students have been a constant target of a capitalist establishment that relies on exploiting and controlling working class people. 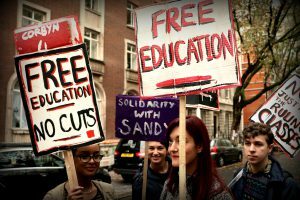 Jeremy Corbyn’s call to scrap tuition fees and to introduce maintenance allowances is a welcome development in the fight for free education. Although there is a way to go before these reforms are won, the Labour Party’s proposal to invest an extra £25 billion into education in England offered a clear alternative to the long-term programme of cuts and corporatisation. Corbyn’s manifesto won significant support from young people in particular, with 60% of voters under the age of 25 backing Labour in the general election. This is an important opportunity for students and socialists in Northern Ireland, who now must take up the fight for free and accessible education for all. Students have been a constant target of a capitalist establishment that relies on exploiting and controlling working class people. The corporatisation of universities is a major attack, and should be resisted. The drive for profit can lead to universities focusing more on areas that are beneficial to big business and less on areas that are beneficial to society and to individuals. The orientation of universities as profit-making institutions is also harmful to the quality of their services, as the interests of a university as a business are often contrary to the interests of staff and students. There can be no room for profiteering in our universities. The deadlock at Stormont has already been seen as an opportunity by the establishment in Northern Ireland to implement unpopular cuts to vital public services. Education has not been immune, with Ulster University’s School of Nursing facing a cut of almost 60% to its budget. The cut was partly reversed after condemnation from health unions and student nurses. In July, the Department of Education tried to cut funding for the school uniform grant by £3 million. This would have slashed the support available to around 98,000 pupils from low-income households. The department ultimately u-turned on this cut too, but it’s clear that education services are still seen as a viable target for austerity. The students’ movement should be prepared to unite with trade unionists and workers to campaign against further attacks, while pressing forward with demands for free and public education. When trying to justify cuts, politicians tend to talk about financial pressure and limited budgets. However these issues aren’t addressed when politicians in Northern Ireland talk about significantly reducing corporation tax, the centrepiece of our political establishment’s economic plan. The reality is that the money for a free and decent education system exists in society and it’s being hoarded by a tiny super-rich minority. Tens of thousands of pounds of debt is an unacceptable price to pay for an education while big businesses and the super-wealthy continue to hoard their wealth and profit off the backs of ordinary people. There is a clear need for students to get organised and fight for our rights. 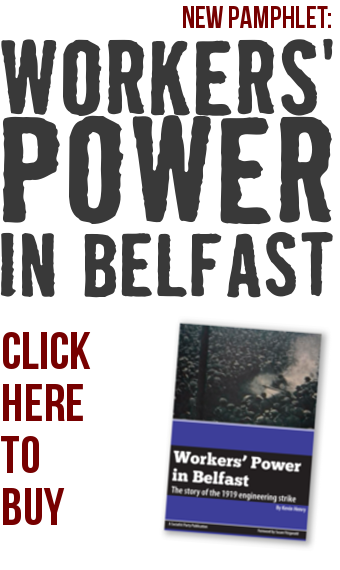 In recent years, student protests in Northern Ireland have blocked prevented plans to increase tuition fees and helped to prevent the abolition of EMA. We need to return to this fighting approach.